Carbide grit edge hole saws, heavy-duty carbide grit edge hole saws, hole saws, saws for cutting holes. Arbors and pilot drills for these hole saws are listed on our Arbors, mandrels page. Hole saw diameters 1 3/16" and smaller, have 1/2"-20 arbor threads. Hole saw diameters 1 1/4" and larger, have 5/8"-18 arbor threads and can all use arbors with drive pins. These thread sizes do not apply to the heavy duty carbide grit hole saws at bottom of page. Additional hole saws include: Bi-metal hole saws , Carbide tipped teeth hole saws , and Diamond coated hole saws . Two different types of Spade bits are also available for drilling and boring through wood and thick FRP. 17/8" depth of cut. Outstanding cutting performance on non-metals including abrasive filled plastics. Fast penetration with almost no friction or heat build-up. As of May 2017, these hole saws are changing to a Disston body with 2 large oval cut-outs in the base plate. Some of the original MK Morse bodies will continue to be shipped until shelf stock is gone. 17/16" depth of cut. 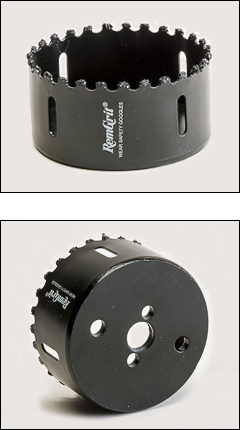 Remgrit carbide grit hole saws cut extremely hard abrasive materials including laminates, fiberglass, ceramic tile, marble, slate, cast iron and composites. Cutting edge of tungsten carbide particles bonded to alloy steel back. Wide gullets dissipate heat to prevent melting plastic. Used to drill through fiberglass boat hulls. Use Remgrit pilot drills for best results. 7/8" depth of cut . 1/4" quick change shank. This style builds up more heat than the gulleted edge. Used for cutting through laminates and counter tops. Shank and pilot are not replaceable. Long lasting saw with 0.09" side wall thickness on 1/4" base plate. Recoatable cutting edge. 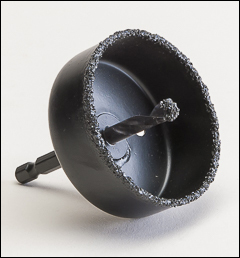 Carbide grit, gulleted edge on a 3" deep hole saw, drills through 4 1/2" of composite material, by drilling in from both sides. Available in any diameter and any depth of cut. Used in tank manufacturing to cut through heavily reinforced knuckles and tie down areas. Won't gum-up the material and stick to edge and delaminate. No problems with broken teeth. These are heavy saws; 4 3/4" dia. saw with 3" depth of cut weighs 3.38 lbs. including arbor. Please call us for a quote on the size you use. Please note....these involve two different manufactures: a custom hole saw body and then a custom coating of carbide grit. Lead times can be 3 to 4 weeks. But these do the job. First crew that ordered these liked them so much, they immediately re-ordered all of the same sizes on original order---just to have them as spares.